Ten-Year Veteran	 Now with an aluminum instead of an iron block, Audi's unique turbo five-cylinder kicks out 400 hp. Ten-Year Veteran	 Behold, the carbon fiber engine cover included in the $6,000 Dynamic Plus Package. Ten-Year Veteran	 RS Design Package adds red trim rings to vents. Does the instrument panel have to be so deep? Ten-Year Veteran	 One display, in front of the driver. HVAC controls in vent hubs. Ten-Year Veteran	 Somehow adding adjustability to the bolsters made them work less well for me. Ten-Year Veteran	 The Audi TT has a back seat, but headroom is in very short supply and legroom can be nonexistent. Ten-Year Veteran	 Your groceries will likely fit with the seats up. Ten-Year Veteran	 Far more cargo space than competitors if you fold the nearly useless rear seats. Ten-Year Veteran	 It's a BMW interior. Busy instrument panel. Ten-Year Veteran	 Current Porsche interior put a lot of visual emphasis (and switches) on the center console. Ten-Year Veteran	 The interior of the previous TT was more traditional and less sophisticated. Ten-Year Veteran	 A radically clean interior. A single screen, as in the Tesla Model 3, but ahead of the driver. Ten-Year Veteran	 The Audi TT's shape finishes even more cleanly than it starts. RS has fixed rear wing. Ten-Year Veteran	 The additional edges continue down the body side. The current TT appears leaner and meaner. Ten-Year Veteran	 Though edgier than before, the Audi TT's shape remains unusually clean, yet far from boring. Ten-Year Veteran	 The previous Audi TT was more round, with chunkier proportions. Also not rounded grille opening. Ten-Year Veteran	 A Porsche 911 with more athletic proportions, thanks to an engine ahead of the axle. Ten-Year Veteran	 The BMW M2 appears handsome and muscular, but can't match the beauty of the othrers. 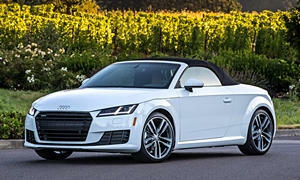 Ten-Year Veteran	 The current Audi TT's face includes far more angles, resembles that of other Audi's.